I originally came across Kino's Journey in its animated form (licensed and distributed by ADV Films) and quickly fell in love with it. I hate to call anything deep and thought-provoking, as those are often just buzz words used to hype something beyond its genre or medium's usual constraints, but Kino's Journey really is very intelligent and pleasantly challenging. In its short run as an anime, it contained some of the best examples I have ever seen of dramatic irony and implied characterization -- allowing you, the viewer, to decide things for yourself rather than having everything spelled out for you. So why is this topic being posted on a thread about books? Because I recognize that some people out there cannot stand anime. Be it the art style or the pacing, or a myriad of other reasons that make it objectionable, some folks don't 'get it' and that's perfectly fine. [Point in fact, I didn't like it myself once upon a time; it took shows like Kino to wake me up to its potential.] What I really want to discuss is the novels that the anime was based upon. You don't have to love or hate anime when it comes to the novels; they don't read like anime or feel the same way at all. In fact, it'd be easy to forget that they're Japanese by and large. The reason this is important is because I'd like people to possibly give them a try. There are eight in total. Kino is a traveler. She has devoted her life to going from one country to another and staying in each only three days. "Three days is enough time to get a feel for a country," she explains. Every country is wildly different and fantastical in its own way, with a culture that is complex and challenging to Kino's own vision of the world and her place in it. Her only companions are her pistols, knives, and motorcycle Hermes (who is able to talk in the world Kino inhabits). On her travels, she comes across a country that forces any visitor to become a gladiator in its arena and fight to the death for the right of citizenship, another in which the concept of majority rules has been taken to its most extreme end, and (in Kino's own home country) a place where the line between child and adult is separated by a surgical procedure -- and many more besides. The stories are interesting, frightening, and sometimes carry with them a very strong analog to something in our own world without being preachy or judgmental. Kino herself is largely dissociated from most countries' strange customs and would prefer to avoid trouble whenever it's possible. She is curious without being nosy and leaves an indelible mark (sometimes by accident) on every country she interacts with. 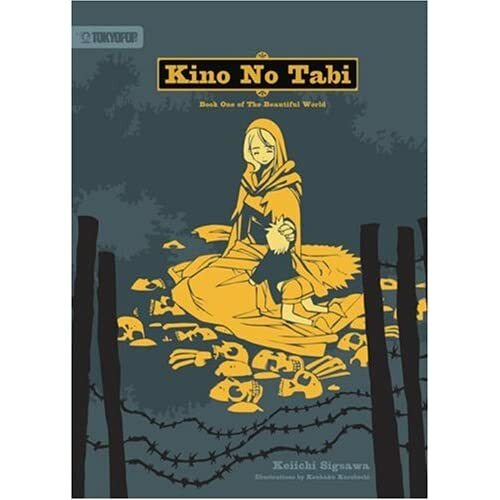 The novel is $7.99 and published by Tokyopop in the States. It is widely available at most large bookstores, some comic shops that carry manga, and of course online retailers. I honestly cannot recommend it enough; it is fascinating and haunting, and seemingly poetic from time to time. It would be hard to find any other book comparable to it in terms of tone and style; it simply stands on its own as some of the most intriguing fiction coming out of Japan right now. I look forward to the future volumes more than any other books around.